New research from the Massachusetts Institute of Technology reveals that some unlikely subjects–bacteria–can have social structures similar to plants and animals. 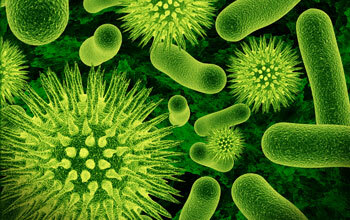 Researchers examined about 35,000 chemical reactions to determine the social roles of bacteria. The research shows that a few individuals in groups of closely related bacteria have the ability to produce chemical compounds that kill or slow the growth of other populations of bacteria in the environment, but not harm their own. Published in the September 7 issue of the journal Science, the finding suggests that bacteria in the environment can play different social roles and that competition occurs not only among individual bacteria, but also among coexisting ecological populations. The National Science Foundation, an independent federal agency that supports fundamental research and education across all fields of science and engineering, funded the research. Cordero and colleagues from MIT, along with researchers from the French Research Institute for Exploitation of the Sea and Woods Hole Oceanographic Institution in Massachusetts, studied whether population-level organization exists for bacteria in the wild. They reasoned social structure can reduce conflict within populations of plants and animals and determine aggression towards competing biological populations. “Think of a population of lions in the Serengeti or a population of fish in a lake,” said Cordero. But could the same be true for populations of bacteria? The researchers found evidence by looking at direct, aggressive competition between ecological populations of bacteria. They reconstructed a large network of bacterial fights–or antibiotic-mediated interactions–between bacteria from the ocean. The scientists analyzed interactions called interference competitions, wherein bacteria produce antibiotics as a means of chemical warfare, to gain a competitive edge by directly hindering the survival of potential competitors. This typically occurs when bacteria compete for the same portion of habitat. The researchers assembled an all-against-all battleground for 185 closely-related, but distinct, members of an ocean-based family of bacteria called Vibrionaceae. They measured bacterial compounds produced by Vibrio isolates that directly antagonized other Vibrio isolates. The framework provided Cordero and colleagues an opportunity to examine about 35,000 possible antibiotic-mediated interactions. The researchers found that ecologically delineated bacterial populations act as socially cohesive units. “In these populations, a few individuals produced antibiotics to which closely related individuals in the population were resistant, whereas individuals in other populations were sensitive,” said Cordero. Thus, aggressive chemical reactions occur between, rather than within natural populations. The findings may help scientists answer questions about the natural role of antibiotics in human contexts. “The research has the potential to bridge gaps in our understanding of the relationships between plants and humans and their non-disease- and disease-causing bacterial flora,” said Robert Fleischmann, a program director in the Division of Biological Infrastructure for the National Science Foundation. In addition, the results help scientists make sense of why closely related bacteria are so diverse in their gene content. Part of the answer, they say, is that the diversity allows the bacteria to play different social roles. Social differentiation, for example, could mitigate the negative effects of two species competing for the same limiting resource–food or habitat, for instance–and generate population level behavior that emerges from the interaction between close relatives. The National Science Foundation (NSF) is an independent federal agency that supports fundamental research and education across all fields of science and engineering. In fiscal year (FY) 2012, its budget is $7.0 billion. NSF funds reach all 50 states through grants to nearly 2,000 colleges, universities and other institutions. Each year, NSF receives over 50,000 competitive requests for funding, and makes about 11,000 new funding awards. NSF also awards nearly $420 million in professional and service contracts yearly.